Lampost, traffic bollard and paltry gewgar thing topped by a stone carving of a pineapple and decorated with the fasces symbol (ax and bound birch sticks) of strength through authority. Originally commissioned in 1804 by Edward Simeon, director of the Bank of England, to provide light for the Reading Market and act as an oversized traffic bollard for wayward wagons. Also described as a pawltry gewgaw thing contrived to gain votes for Edward Simeon’s brother in Reading MP elections. Locally it is more commonly referred to as the ‘Soane Monument’ after the locally residing, now dead, architect, Sir John Soane, who designed both it and the Bank of England. 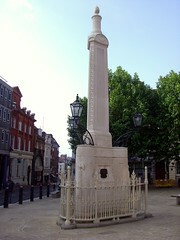 The monument is currently all clean and pretty because it was restored in 2007.